The end game has at last arrived in the NFL’s 2017 regular season. All the Week 17 games that really matter got shifted by the league into the late-afternoon kickoff time slot, which should make for three-plus hours of zany fun in terms of Red Zone Channel watching, as three playoff berths and seeding issues get decided. Two matchups lead the way: Carolina at Atlanta and Jacksonville at Tennessee should feature the most palpable sense of desperation, because both the Falcons and Titans are at home and need to win in order to lock down the No. 6 seeds in their respective conferences. I’ve got one of them making it and the other one missing out, but read on to see which is team is moving on and which is going home. With Super Bowl LII in Minneapolis just five weeks away, there are six teams still alive and fighting for those final three spots in the 12-team postseason field. Let’s hope the story concludes with a flourish. * Last week’s picks: 13-3 (.813); Season: 48-16 (.750). Green Bay at Detroit — Both teams underachieved this season, but at least the Lions still have a shot at a winning record, which would be their third in Jim Caldwell’s four-season tenure. Will that be enough to earn him a fifth season in Motown? I’m not optimistic on that front. Winner: Detroit. Houston at Indianapolis — Colts head coach Chuck Pagano this week called it the “last rodeo’’ for his last-place team. And you know what that means. Win or lose he’s about to get thrown off his ride, and out of a job. I predict he’ll at least exit with one last “W” on his record. Winner: Indianapolis. Chicago at Minnesota — The Vikings begin what they hope is a crazy memorable four-game home-stand, culminating in the big confetti shower and a parade in early February. Even if there is a road trip to Philly dropped in there, the Vikings will gladly roll with that. Winner: Minnesota. New York Jets at New England — With the AFC’s top seed waiting to be wrapped up, the Patriots are going to take care of business against the Jets and QB Bryce Petty. They learned their lesson two years ago when they let home-field advantage slip through their fingers and wound up losing the AFC title game in Denver. No more taking their foot off the gas. Winner: New England. Washington at New York Giants — Will we ever see QB Kirk Cousins in Washington and QB Eli Manning in New York after the conclusion of this game? I’ll wager two guesses: Yes and yes. Washington has a shot to finish at .500, which is at least some motivation. The Giants will likely have their cars idling in the players parking lot from the second quarter on. Winner: Washington. Dallas at Philadelphia — We’re used to big games between these two in Week 17, but we couldn’t be further from that reality this season. The top-seeded Eagles will likely rest plenty of starters while the Cowboys play it out in pursuit of a winning season at 9-7. Winner: Dallas. Cleveland at Pittsburgh — It sounds like the Steelers are going to rest plenty of their stars, having little or no faith the Jets will upset the Patriots on the road and put the AFC’s No. 1 seed back into play. That’s an accurate read of the situation, Mike Tomlin. That could give the desperate Browns a shot at their first victory and avoiding the infamy of 0-16, but I’m not about to show enough confidence in Cleveland to predict it. Winner: Pittsburgh. Carolina at Atlanta — The Falcons have been difficult to read all season, but I think they’ll muster up just enough offense to prevail in this win-and-you’re-in scenario at home. Only barely, but Atlanta will at least avoid the missing the playoffs part of the Super Bowl hangover effect. Winner: Atlanta. Cincinnati at Baltimore — The Ravens are 9-1 this season against teams that won’t make the playoffs. It’ll be 10-1 after Sunday, and will ensure Baltimore’s first playoff berth since 2014. Winner: Baltimore. Buffalo at Miami — I hope I’m wrong on this one, because it’d be fun to see the party that would ensue in Buffalo if the Bills wind up breaking their NFL-worst 17-season playoff drought. But something tells me the Dolphins are going to do just enough to dash Buffalo’s hopes. Winner: Miami. New Orleans at Tampa Bay — Once 0-2, the high-octane Saints will cruise into the playoffs with a wave of momentum behind them, routing a Bucs team that looks to be coming apart at the seams. Winner: New Orleans. Jacksonville at Tennessee — Tennessee’s collapse will be complete after this one, and it very well could cost Titans head coach Mike Mularkey his job. The Jaguars want to wipe away the stench of last week’s loss to the 49ers, and also keep Tennessee from being their first-round playoff opponent next week in Jacksonville. Winner: Jacksonville. Kansas City at Denver — Paxton Lynch starts at quarterback for Denver and rookie Patrick Mahomes for Kansas City. I’m flipping a coin and going with the Broncos to find a way to finish with a win and get head coach Vance Joseph’s first season record to 6-10. Will that still be one-and-done territory for Joseph? We’ll find out on Black Monday, because John Elway isn’t one to wait around after making a decision. Winner: Denver. Oakland at Los Angeles Chargers — The Raiders were an enigma this season after their mirage of a 2-0 start. Oakland just wants its nightmare over with. The Chargers still have a shot at the playoffs and will do their part in the intriguing AFC wild-card race. Winner: Los Angeles. San Francisco at Los Angeles Rams — With Rams head coach Sean McVay planning to rest many of his best players, including MVP candidate RB Todd Gurley and quarterback Jared Goff, that swings this game to the red-hot 49ers and the unbeatable QB Jimmy Garoppolo. He’ll lose a game as an NFL starting quarterback some day, but not this season. Winner: San Francisco. Arizona at Seattle — In picking Atlanta to win at home against Carolina, as I have, that means the Seahawks’ final shot at the playoffs will be snuffed out. But Seattle will still take solace in finishing 10-6 despite a host of key defensive injuries. It’ll be the Seahawks’ third straight year with 10 wins, and six in a row in double digits. Winner: Seattle. This week’s Situational Call isn’t one specific play call that altered the outcome of the game. Instead, it is the series of play calls Doug Marrone and his staff were able to put together in order to mount a late-stage comeback for the Jacksonville Jaguars against the San Francisco 49ers in Santa Clara. 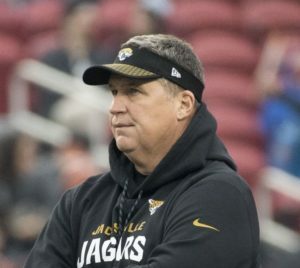 It’s easy to lose grasp of a game late in the season when a playoff berth and division title is wrapped up, but credit to Marrone and the Jaguars for not folding on a cross-country road trip despite being down late in the 4th quarter. The game didn’t start optimistically for the Jaguars either. They were kept off the scoreboard and could have gone down 17-0 if it weren’t for a blocked extra point that was returned for a touchdown three minutes into the 2nd quarter. That sparked the Jacksonville offense as they scored two touchdowns on their next two drives to send the game tied into halftime. They jumped ahead 19-16 on the first drive of the 2nd half, but an interception on their next drive would swing the momentum the other direction. A punt and another turnover and now San Francisco led 37-19 with about six minutes left in the game. Marrone may have been tempted to remove starters and get rested for the playoffs. He chose not to; he was going to test just how much a team can do under those circumstances. Turns out, a team can do a lot, especially when the 49ers got sloppy at trying to close out the game. The Jaguars drove 85 yards for a quick touchdown, and with a 2 point conversion, they trailed 37-27, with 2:17 left and all three timeouts. An onside kick recovery led to another quick touchdown, and now they trailed by only 37-33 (the Jaguars missed the extra point kick). Marrone now was actually in some control of the game. He could choose to try to pin the 49ers with a deep kickoff and use all of his timeouts, or he could try another onside kick, and still use all of his timeouts, although if he did stop the 49ers offense, his offense would be facing a longer field. He chose the onside kick, which failed this time. The 49ers scored a clinching touchdown, and that was it. But 18 down with less than seven minutes? Doug Marrone proved that it’s still very much a game, and this week’s Situational Call of the Week. 1. New England (12-3) — The Patriots are a win over the Jets away from being the AFC’s No. 1 seed, and that has meant a Super Bowl trip for New England in five of the six instances they’ve secured the top spot, including the past three instances (2016, 2014 and 2011). Tom Brady’s recent spate of interceptions is concerning — he has thrown picks in five straight games for the first time since 2002 — but all that postseason experience is still a huge check mark in the Patriots’ favor. 2. 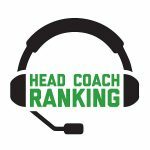 Philadelphia (13-2) — There are no flawless teams in the NFL this season, so the Eagles have every reason to say “Why not us?’’ The sloppy showing by Nick Foles against the Raiders Monday night will shake the confidence of some of the Philly faithful, but it shouldn’t send anyone into an all-out panic. Locking up the No. 1 seed and home-field advantage should be huge for the Birds come January. 3. Minnesota (12-3) — The Vikings’ dream of being the first team to play a Super Bowl in their own stadium is still very much alive, even if it might require a one-week road trip to Philadelphia. Mike Zimmer’s team is a resilient bunch, but home games in the playoffs are the proven path to success. 4. Pittsburgh (12-3) — The first-round bye the Steelers earned with Monday’s blowout win at Houston was crucial, because it buys needed time for Antonio Brown’s calf injury to heal. Pittsburgh still looks headed for that rematch with New England — in Foxboro this time — and everything before that showdown feels like mere prologue. 5. Los Angeles (11-4) — The Rams have lost to both the Eagles and Vikings, the teams that likely will be seeded ahead of them. But Sean McVay’s club still feels like a dangerous opponent that will be playing with house money in January, given how far and how fast they’ve come on. 6. New Orleans (11-4) — The Saints aren’t assured of a home playoff game yet, but they’re a win at Tampa Bay away from heading into the postseason with legitimate dreams of doing what the last two NFC South champions did the past two years: Reach the Super Bowl. If the Panthers and Falcons could do it, the Saints have to believe they can make it three straight. 7. Jacksonville (10-5) — That wasn’t a confidence-inspiring performance at San Francisco on Sunday, but the Jaguars are still a young team trying to figure out this winning-season stuff. Jacksonville is locked into the No. 3 seed in the AFC, but it’s pretty important how the Jags play this week at Tennessee, because another shaky performance might make everyone presume they’re one-and-done material. 8. Carolina (11-4) — They don’t make it easy on themselves, but the Panthers have been getting the job done from a bottom-line perspective. Carolina’s past four wins have been by 8, 7, 7 and 3 points, and they can still win the NFC South and even clinch a first-round bye if the Saints, Vikings and Rams all lose. 9. Baltimore (9-6) — The Ravens’ strong finish has been marred by only a one-point loss at Pittsburgh in the past six games, so they have a rightful claim to being as hot as almost any in the league. As with past John Harbaugh playoff teams, Baltimore is tough-minded and not intimidated by either the Patriots or Steelers. 10. Kansas City (9-6) — Three wins in a row when they absolutely had to have them have gotten the Chiefs back to a good place. But No. 4-seeded Kansas City is a streaky team and the Chiefs enter the postseason with that inconsistency as their trademark. 11. Atlanta (9-6) — In their post-Super Bowl season, the Falcons have had to struggle for everything they’ve gotten. Why should it be any different in Week 17, when a win over the visiting 11-4 Carolina Panthers (or a Seattle home loss against Arizona) is the key to a second consecutive playoff trip? Falcons fans now know the hangover effect is real. 12. Seattle (9-6) — A week after getting embarrassed at home by the Rams, the Seahawks showed me a little something with that win at Dallas in Week 16. But it might still wind up being too little, too late if they don’t win this week and get Panthers to knock off the Falcons in Atlanta. Are we watching the end of an era in Seattle this week? 13. L.A. Chargers (8-7) — The Chargers have won five of six to finish strong, but the one they lost still might wind up being the one they absolutely had to win to advance. Beating the Raiders at home is doable, but then Los Angeles needs help in the to reach the postseason after its galling 0-4 start. 14. Buffalo (8-7) — The Bills have playoff implications to contend with in Week 17 for the first time since 2004, so that’s progress in and of itself in the debut year of the Sean McDermott coaching era. But if Buffalo comes up a game short of the postseason, and sits out the Super Bowl tournament for the 18th staight year, you know that Nathan Peterman start in Los Angeles in Week 11 is going to come back to haunt the already haunted Bills fans. 15. Tennessee (8-7) — Staggering to the finish line in what was supposed to be their break-through season, the Titans have lost three in a row and their identity. It’s man up and beat AFC South champ Jacksonville at home on Sunday, or be remembered as a team that choked away what would have been its first playoff berth in nine years. The most important decision in the game was that the Cowboys didn’t get the ball to their best offensive player, RB Ezekiel Eliott when they needed him the most. Elliott who had been running hard and getting key yards behind a good Cowboys run blocking team didn’t get the ball late in the game. With 7:54 remaining in the fourth quarter, Dallas faced a two score deficit and with the ball at the Seattle 3 and a fresh set of downs. On first down, Dak Prescott attempted to pass the ball on a run-pass-option, however, Prescott quickly abandoned the idea and scrambled for a one yard gain. On second down, the Cowboys would again try to throw, but Jason Witten was called for holding. The penalty was accepted and on the ensuing second down play, Prescott was sacked for an 11-yard loss. On 3rd and 23, Prescott found Witten for a 7-yard completion. On fourth down, Cowboys kicker Dan Bailey missed a 34-yard field goal. The game was effectively over at this point. Had Dallas gotten the ball to Elliott, there was a strong possibility that they would have fond the end zone and cut the Seattle lead. The Seahawks have a big receiving corps which includes tight end Jimmy Graham. Though they struggled greatly on offense, they were able to find the end zone and use their pass catchers’ size to force mismatches. Seattle was able to score their first two offensive touchdowns due to pass interference penalties because the smaller Cowboys defensive backs were having issues with the bigger pass catchers. The Dallas offensive line needed help. The decision to not someone in that could protect QB Prescott or chip at edge rushers would prove to be the team’s downfall. Offensive tackle Byron Bell needed help in pass protection and the Cowboys were unable and unwilling to provide it. Seattle teed off, especially late in the game when it became obvious that Dallas would need to throw to get back in the game. Seattle knew that the Cowboys offensive line could not hold up. Seattle’s defense stepped up after having a tough time the week before against the NFC West Champion, Los Angeles Rams. Seattle decided they would play man on WR Dez Bryant rather than double team him. Perhaps earlier in his career, Dez would be a player that a team like Seattle would roll a safety over to his side for. Dallas doesn’t have enough playmakers on this roster to help Prescott and Elliott against a defense like Seattle. By “singling” Dez Bryant, Seattle was able to get into a good defensive rhythm. Dallas would not score an offensive touchdown. The Dallas defensive line also had success against the Seattle offensive line. The Cowboys front didn’t allow Seattle to get into any offensive rhythm. QB Russell Wilson threw for 93 yards on 21 passing attempts and two touchdowns. Taco Charlton was a constant disruptive force throughout the game. Dan Bailey kicked a 51-yard field goal to take a 9-7 lead into the half. Dallas had saved two timeouts at the end of the half, after a Seattle touchdown that allowed them to move the ball downfield in order to attempt a field goal. However, they used their final timeout with 18 seconds left and they attempted one more pass play (incomplete pass to TE Jason Witten) before attempting a field goal. By calling a timeout at 18 rather than spiking the ball, they may have stopped themselves from running a play to the end zone or at very least, a more makeable field goal attempt. The field goal attempt was good anyway. Seattle had more penalty yards (142) than they did total yards (136). The Dallas loss keeps them out of the playoffs. They have missed the playoffs in two of the last three years. In Jason Garrett’s seven full seasons as head coach, the Cowboys have made the playoffs twice (2014 and 2016).